Eric Thompson’s wolf howl can ruin electronics and send aircraft tumbling from the sky. Considered dangerous even by his fellow Sazi, Eric has become a lone wolf, living in self-imposed isolation. Yet when the very foundations of Sazi life come under attack, Eric knows he must defend his fellow shapeshifters at any cost. The Tales of the Sazi is one of the first Urban Fantasy series that I have really enjoyed over the years that helped to cement my addiction to this genre. In this latest instalment, Serpents Moon culminates in several plot-lines from the series which includes the ongoing Mardoc story-line, who has threatened the Sazi as well as the wider world. There are also appearances from several leading recurring characters, including my favourites such as: The hitman known as Tony Giodon, Ahmed the acerbic shapeshifing snake, and new characters that have been introduced who will become integral to the series such as Eric Thompson, who is the main hero of this story. Serpents Moon is a book that is a game changer in many ways, and where established characters are changed forever. This book adds new developments and changes the direction of the Sazi. Following the attacks by the followers of Marduc on the Sazi around the world, Eric Thompson – who is a new Alpha with a powerful gift – and Holly Sanchez – who has known Eric previously from his old pack – find themselves in the midst of a full blown war. Marduc’s allies have allied themselves with snake and spider shifters, and have the potential to gain more by decimating other Sazi packs. I liked Holly, who appears in a previous book as a supporting character, so I found that she was more developed than Eric who appears for the first time in this series. I think for an important character, and especially one with a powerful gift, I found that his character was underdeveloped compared to Holly. Eric was supposed to be an alpha, but I didn’t really get this element from his character and felt like he was more of a beta in many ways. And it showed – especially with his scenes with the other alpha characters, and even Tony, who I thought overshadowed him. However I did think that Holly and Eric’s romance was set up well – especially since there was a lot of back story that was not previously shown, and I thought that they both had good chemistry. But I did feel that their relationship was not as developed as it could have been, although I could understand why this was the case due to the major events happening. 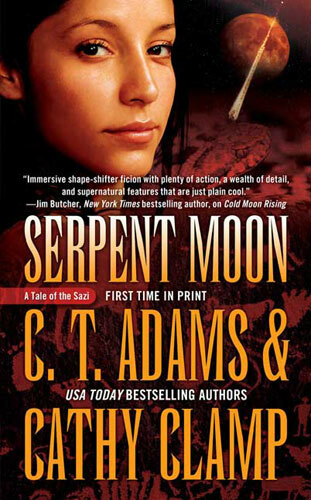 Although I found that the romance was not a strong point of the book, Serpents Moon was a very good and solid installment in the series. And in many ways it is a transitional book that sets up exciting possibilities for the next story arc with supporting characters. With engaging and memorable characters whom I am really looking forward to see the new changes and developments. And the Sazi saga shows that there is still lots more to explore and read. I would actually say yes- although you would miss out on characters and their development from previous books and the worldbuilding and how that is sets out. But each book tends to focus on a different couple with the big bad/problem with ongoing plot threads from previous books. Serpents Moon actually ends the current arc with Marduc and sets up new ones but I don’t think you would have no problems picking things up in the book. I’ve long been meaning to give CT Adams and Cathy Clamp a go. Glad to know that they can be read as standalones if pressed–but I’ll try to pick up some of their earlier work.